Q: What is different about this season compared to last season? A: “Last year having fourteen to fifteen people on the team was stressful and after the normal season ended and it was just the two girls practicing for State. We got a lot more dives in and I improved a lot more than I did over the entire season. 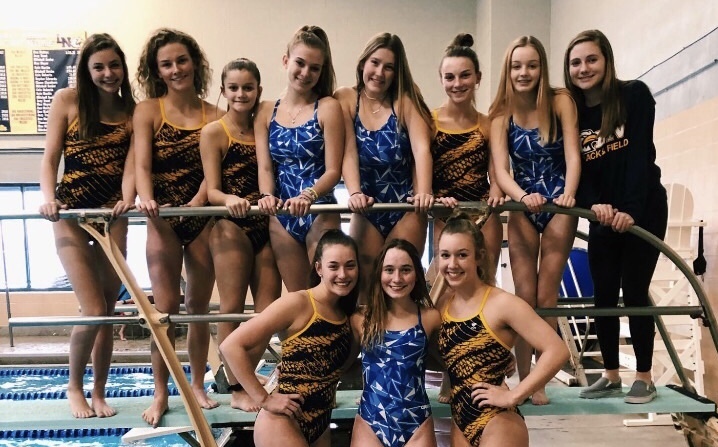 So he [the Dive coach] agreed to let us [seniors] make cuts so that we will have fewer girls on the team, get more dives in, and be able to improve throughout the entire season,” senior Diver Grace Ericsson said. Q: How do you feel now versus the beginning of the season? A: “At the beginning of the season I was really nervous since I had never done Dive before and now I feel a lot more confident and I have more dives than I thought I would be able to do,” freshman Diver Madelyn Hartman said. Q: How was it joining the team as a freshman? A: “It was a little scary because I didn’t know anyone but throughout the season I have gotten closer with everyone. The whole team, including the Liberty Divers, who we practice with, are all very supported of each other,” Hartman said. Q: What is your favorite part of high school Swim? A: “My favorite part of Swim is the team aspect of it. I like being around all the teammates, having that atmosphere, and that type of support group that Swim gives me,” junior Swimmer Kate Huyser said. Q: Has this Swim season lived up to your expectations so far? Q: What are you looking forward to for the last couple weeks of Swim? A: “I’m looking forward to seeing how well we place this year, with how many swimmers we have qualified as of now for State. I’m also looking forward to seeing how well we do at Conference,” Huyser said. Q: Has this Dive season lived up to your expectations so far? A: “I definitely think this season has lived up to the expectations I had at the beginning of the season. With it being my senior year I wanted to finish strong and I think I have. There’s been a lot of good memories with the team and qualifying for state. I’ve done really well this year and placed 2nd at the last six-dive meet, which was awesome. I have also gained a lot of dives this season and corrected some flaws from my dives I already had,” senior Diver Grace Cantrell said.